At least 2,000 people protested on Tripoli's central Martyrs' Square on Friday against Khalifa Haftar, the Libyan warlord fighting to capture the capital, and his offensive. Some protesters also criticised US President Donald Trump's call to the commander, denouncing Haftar and those who support him. "The call has no meaning but we will respond to it," said Abdelrizaq Musheirib, a protester. "We, the Libyan people are against Trump, and against Haftar. We want civilian rule, freedom, science and culture. 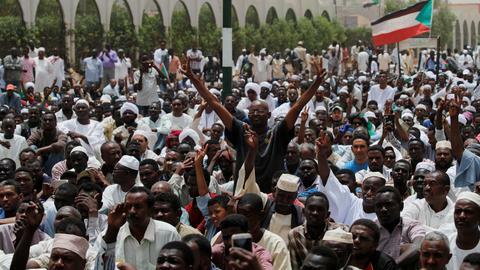 We want to live as other people do," Nour Mohamed, another protester. Ahmed Mismari, a spokesman for Haftar's Libyan National Army (LNA), said Trump's call showed the pivotal role of the LNA in fighting terrorism, Sky News Arabia reported. Trump spoke this week with Haftar, the White House said on Friday. Trump and Haftar spoke on Monday "to discuss ongoing counterterrorism efforts and the need to achieve peace and stability in Libya," according to the White House press office. The statement said that Trump "recognized Field Marshal Haftar's significant role in fighting terrorism and securing Libya's oil resources." In their phone call, "the two discussed a shared vision for Libya's transition to a stable, democratic political system." The UN said on Friday it had evacuated 163 refugees from war-ravaged Libya to neighbouring Niger, but more than 3,000 others were still trapped in detention centres affected by clashes. "Given the situation in Libya, humanitarian evacuations are a lifeline for detained refugees whose lives are in jeopardy in Libya," UN refugee chief Filippo Grandi said in a statement. Khaled al Mishri, president of Libya High Council of State, said on Thursday that the "UAE and Egypt were providing direct support to Haftar, according to UN reports." He added that the armoured military vehicles "seized from Haftar's forced were Emirati vehicles" that recently arrived in Libya after the embargo and further said that the strongman's forces also have "newly-made Egyptian ammunition." The interior ministry of Libya's internationally recognised government accused France directly for the first time of supporting Haftar. Interior minister Fathi Bach Agha ordered the "suspension of all relations between the ministry and the French side... due to the position of the French government in support of the criminal Haftar", it said in a statement. A French presidential official rebutted the claim, saying "France supports the legitimate government of Prime Minister [Fayez al] Serraj and the mediation of the UN for an inclusive political solution in Libya,"
Libya's unity government on Thursday issued an arrest warrant for Haftar for allegedly ordering deadly air strikes against civilian areas. Six of Haftar's officers were also named in the warrant issued by the military prosecutor general, which was published by the unity government's press office. 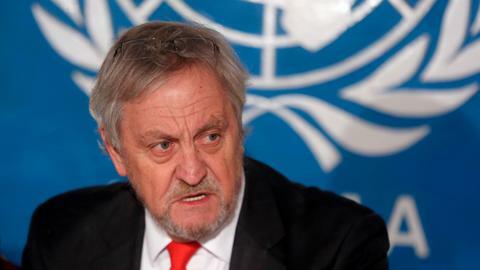 The UN's Libya envoy said that international divisions had encouraged Haftar to launch his assault on Tripoli. But for now, there was "deadlock" in fighting south of the capital between Haftar's self-styled Libyan National Army (LNA) and the internationally recognised government, said Ghassan Salame. "After the very first successes of the Libyan National Army two weeks ago, we are witnessing a military deadlock," he said. The UN Security Council has been deeply split on how to address the crisis in Libya after fresh negotiations on a draft resolution demanding a ceasefire in Tripoli failed to yield an agreement. Russia has sought to block any language that criticised Haftar's offensive as a threat to Libya's stability. The United States also said it would not support a United Nations Security Council resolution calling for a ceasefire in Libya at this time, diplomats said, as mortar bombs crashed down on a suburb of the Libyan capital, Tripoli. Germany, which holds the council presidency, called for an urgent meeting on Thursday, when the council was to hear a briefing on the situation on the ground and "consult on the way forward," according to a note seen by AFP. Britain has put forward a draft resolution calling for an immediate ceasefire and de-escalation but Russia put up its concerns over language that criticized Haftar's offensive. A slightly watered-down version was put forward by Britain on Wednesday, but the three African countries on the council – Equatorial Guinea, Ivory Coast, South Africa – blocked it. 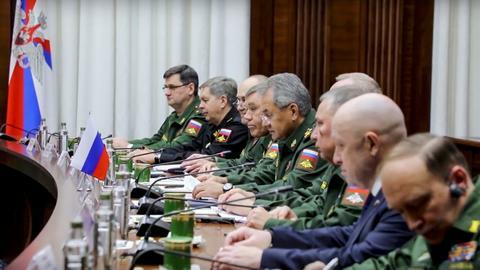 Moscow also said the proposed measure even after it was amended was "still far away from accommodating our concerns," according to a note from the Russian mission seen by AFP. The revised text did not single out Haftar's forces, but instead expressed "grave concern at military activity" near Tripoli, "including the launching of a military offensive by the LNA." The United States and Russia made their positions clear during a closed-door council briefing by UN Libya envoy Ghassan Salame, who diplomats said appealed for a ceasefire, warning that weapons were pouring into the country and it was heading toward a serious humanitarian situation. The US reluctance to support Security Council action is in contrast to Washington’s earlier public opposition to Haftar’s offensive, which began while UN Secretary-General Antonio Guterres was visiting Tripoli. Some UN diplomats have suggested the United States might be trying to buy time as President Donald Trump’s administration works out how to deal with the latest developments in Libya. The three African countries insisted that there be a reference to an African Union statement on the need for all parties fighting in Tripoli to protect civilians, including migrants and refugees, according to documents seen by AFP. Britain had hoped to hold a vote before Friday, but that now looks unlikely. Diplomats said the United States appeared to be dragging its feet in pushing for a quick adoption of the draft resolution. Shells slammed into a densely populated district of Tripoli late on Tuesday, piling misery on civilians from a two-week assault by Haftar’s forces to take Libya’s capital from an internationally backed government. Shells slammed into a densely-populated district of Tripoli overnight, piling misery on civilians from a two-week assault by commander Khalifa Haftar's forces to take Libya's capital from an internationally backed government. About 10 GRAD rockets hit the southern residential area of Abu Salim just before midnight on Tuesday, witnesses and authorities said, killing at least seven people, mainly women, and wounding 17. The Tripoli offensive led by Haftar aims to clear terrorists out of Libya, and the offensive will not stop until victory, spokesman Ahmed al Mesmari of the self-proclaimed Libyan National Army (LNA) has said. “This battle comes within the framework of a comprehensive war on terrorism. In 2014, the decision was made to purge the country of terrorist organisations, gangs and armed groups. The Government of National Accord (GNA) is now a completely paralyzed government whose decisions are now invalid,” said Mesmari. The International Criminal Court's chief prosecutor warned she "would not hesitate" to broaden her investigation into Libya war crimes amid intensified fighting near the capital Tripoli, which killed at least 174. Fighting broke out on April 4, when Haftar launched an offensive to take Tripoli, the seat of the UN-backed GNA. The UN migration agency says recent clashes between rival Libyan militias for control of Tripoli have displaced more than 18,000 people. UN spokesman Stephane Dujarric said in New York that the International Organization for Migration reported that 13 civilians are among the 146 killed so far in clashes since the self-styled Libyan National Army launched a major military offensive. The UN health agency earlier said the recent clashes killed 146 people this month but hadn't specified whether they were civilians or fighters. The World Health Organization (WHO) said on Sunday that 614 others have been wounded since the launch of the offensive. More than 120 people have been killed since a Libyan military commander launched the assault on the capital 10 days ago, igniting clashes with rival militias, the UN health agency said on Sunday. Libya's UN-backed government said its forces shot down a fighter jet belonging to forces of Haftar south of the capital Tripoli. Protests erupted across Libya in opposition to potential military rule under Haftar as UN-backed government forces in Tripoli clashed with Haftar's LNA. More than 1,000 people gathered in central Tripoli to demand Haftar, a former general in Colonel Gaddafi's army who later joined the revolt against him, stop the advance on the coastal city of about 1.2 million people. Protesters defied the echoing of explosions and gunfire through the capital's street to show their opposition to Hafta and foreign intervention, carrying banners reading "Haftar is a war criminal" and "France, hands off Libya". Gunfire and blasts echoed through Libya's capital on Friday as eastern forces fought troops of the internationally recognised government in southern Tripoli suburbs, forcing thousands of civilians to flee their homes. A week of battles has killed 75 people – mainly fighters but also 17 civilians – and wounded another 323, according to the latest UN tallies. The WHO has said it feared outbreaks of infectious diseases due to dirty water and people fleeing fighting nearing Tripoli, where it has about two weeks of emergency supplies for hospitals and health facilities. The WHO has delivered trauma kits and medicines to hospitals, Dr Syed Jaffar Hussain, the world body's representative in Libya, told a Geneva news briefing by telephone from Tripoli. "These supplies will last for two weeks, the acute phase," he added. The escalation in violence in and around Libya's capital has resulted in the displacement of more than 8,000 people, the United Nations said Thursday. UN spokesman Stephane Dujarric said the fighting in the past 24 hours was "the heaviest since the outbreak of hostilities." The European Union urged the LNA forces of General Haftar to stop their offensive on the Libyan capital Tripoli. Haftar's attack on Tripoli and the subsequent escalation is endangering civilians and disrupting UN talks, High Representative of the European Union for Foreign Affairs and Security Policy Federica Mogherini said. The statement from the bloc's top diplomat had been held up for a day as France and Italy sparred over how to handle the escalating conflict. More than 190 troops from eastern Libyan forces have been captured during their offensive on Tripoli, officials loyal to the internationally recognised government based in the capital said on Thursday. A total of 116 fighters were captured in Zawiya, a town west of Tripoli, and an additional 75 in Ain Sara on the southern outskirts of the capital, officials said, allowing reporters to film some of them. Libya’s Tripoli-based government said on Thursday it has recaptured the Yarmuk military camp south of the capital from forces led by Commander Haftar. The Al Sumud front supported the operation, a military source who declined to be named told Anadolu Agency. Haftar’s forces said earlier on Wednesday that they had captured the camp from UN-backed government forces. The camp is in the Ain Zara area, which had been witnessing clashes between Haftar’s forces and government forces. Earlier, Haftar’s forces claimed on Thursday to have captured the former Tripoli International Airport from the UN-backed government. UN Secretary-General Antonio Guterres called Wednesday for a ceasefire in Libya to prevent all-out fighting for control of Tripoli. "It's still time to stop," Guterres told reporters after briefing the UN Security Council in a closed session. "It's still time for a ceasefire to take place, for a cessation of hostilities to take place, and to avoid the worst, which would be a dramatic bloody battle for Tripoli." Forces led by Commander Haftar claimed to have captured Libya’s Yarmuk military camp, south of the capital Tripoli, from the UN-backed government. In a brief statement, the Haftar-led forces said they have set control over the Yarmuk camp, adding they are advancing towards Tripoli’s centre. NATO is "deeply concerned" by the escalating violence in Libya, alliance chief Jens Stoltenberg said, calling on all sides to stop fighting as the deadly power struggle rages. Stoltenberg urged the rivals to support UN efforts to broker a truce. Libya's Parliament speaker in the east said no peace deal can be reached right now between rival factions in his country because Tripoli, has been "kidnapped" by armed groups. Aguila Saleh, speaker of the Tobruk-based House of Representatives, said from the Egyptian city of Alexandria that the self-styled LNA has stepped in to "liberate" Tripoli. Eastern forces and troops loyal to the government in Tripoli fought on the outskirts of Libya's capital as the battle forced thousands of residents to flee their homes. The LNA forces of eastern commander Haftar had taken up positions in the suburbs about 11 kilometres (7 miles) south of the centre, with steel containers and pickups with mounted machine-guns blocking their way into the city. The UN Security Council will hold urgent closed-door consultations on Wednesday on the crisis in the country. Salame will brief the council on his decision to postpone the national conference, diplomats said. The UN postponed a Libyan national conference aimed at drawing up an election roadmap because of fighting raging near the capital, in another setback to peace efforts. "We cannot ask people to take part in the conference during gunfire and air strikes," UN envoy Ghassan Salame said. Turkish foreign minister said the recent escalation in Libya should be tackled through dialogue instead of military aggression. A lawmaker says suspected Daesh militants attacked a small town in central Libya, killing at least three people, including the mayor. Ismail al Sharif said the attack happened overnight. He says the militants torched several houses in the town of al Fuqaha, south of the coastal city of Sirte, a former Daesh bastion. UN chief Guterres on Monday appealed for an immediate halt to fighting in Libya, after strongman Haftar's forces claimed an airstrike on Tripoli's only functioning airport. Secretary-General Guterres "urges the immediate halt of all military operations in order to de-escalate the situation and prevent an all-out conflict," said a UN statement late on Monday. A warplane attacked Tripoli's only functioning airport, a resident said. Airport security said Libyan authorities closed the airport after the air strike. The eastern Libyan LNA forces of Haftar, a former officer in Muammar Gaddafi's army, said 19 of their soldiers had died in recent days as they closed in on the internationally recognised government in Tripoli. But the UN-backed government of Prime Minister Fayez al Serraj has armed groups arriving from nearby Misrat a to help block the LNA. The United States is "deeply concerned" by fighting near Libya's capital Tripoli and is seeking an "immediate halt" to an offensive by strongman Haftar, Secretary of State Mike Pompeo said on Sunday. "We have made clear that we oppose the military offensive by Khalifa Haftar's forces and urge the immediate halt to these military operations against the Libyan capital," he said in a statement. "The United States continues to press Libyan leaders, together with our international partners, to return to political negotiations mediated by UN Special Representative of the Secretary-General Ghassan Salame," he added. Fighting raged south of Libya's capital Sunday despite a UN call for a two-hour ceasefire, as forces of Haftar and the internationally recognised government exchanged air strikes. The Health Ministry of the UN-backed Libyan GNA said in a statement late on Sunday that clashes in the southern part of the capital, Tripoli, resulted in 11 killed and 23 wounded. Earlier, the UN said there had been "no truce" despite calls for a two-hour pause in fighting for civilians and the wounded to flee. Oil-rich Libya has been riven by chaos since the NATO-backed uprising in 2011 that killed Gaddafi, as rival administrations and armed groups have battled for power. At least 21 people have been killed since the start of a four-day-old offensive by Libyan strongman Haftar to take Tripoli, the country's UN-backed government said Sunday. On Saturday, Haftar's self-styled LNA reported 14 deaths among its fighters. The UN made an "urgent" appeal on Sunday for a two-hour truce in the southern suburbs of Tripoli to evacuate wounded and civilians as Libyan forces of Haftar pushed to take the capital. UNSMIL, the UN mission in Libya, called on "all armed parties in the Wadi Rabi area, Al-Kayekh, Gasr Ben Ghachir and Al-Aziziya to respect a humanitarian truce (between 1400 and 1600 GMT) to secure the evacuation of wounded and civilians by rescue teams and the Libyan Red Crescent". Forces of Haftar said Sunday they carried out their first air strike on a suburb of Tripoli, where loyalist fighters announced a "counteroffensive" to defend the capital. The announcement of the air raid was made on the Facebook page of the "media office" of Haftar's self-styled LNA as fighting raged around 50 kilometres south of Tripoli. 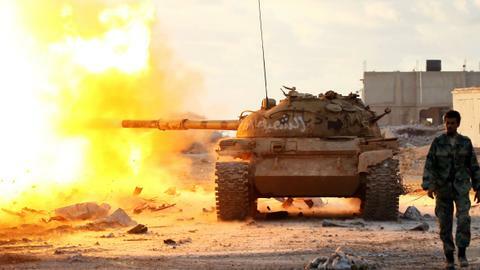 Libya government forces have announced a 'counteroffensive' to defend Tripoli from rival Libyan forces led by Haftar. The US military said Sunday it had temporarily pulled some of its forces out of Libya amid an upsurge of fighting in the North African country. Forces loyal to Libyan commander Haftar were pressing on at the weekend with an offensive on the capital Tripoli, seat of the internationally-recognised GNA. Forces loyal to rival Libyan army commander Haftar said Saturday they seized control of the main airport in Libya's capital Tripoli, two days after Haftar ordered his forces to seize the seat of Libya's UN-backed government. Haftar's media office said in a post online that they took full control of the Tripoli international airport and were working to secure the facility. They posted photos of troops apparently inside the airport, saying "we are standing at the heart of the Tripoli international airport." The head of Libya's internationally-recognised government, Fayez al Sarraj, on Saturday accused his rival Haftar of "betraying" him after the military strongman launched an offensive against the capital Tripoli. "We have extended our hands towards peace but after the aggression that has taken place on the part of forces belonging to Haftar and his declaration of war against our cities and our capital... he will find nothing but strength and firmness," Sarraj said in a televised speech. "We strongly condemn the air raid... in the Al Aziziya region" by a plane, which had taken off from western Misrata," the forces media office said. Eastern Libyan forces on Friday seized the former Tripoli International Airport on the southern outskirts of the capital, a spokesman said. Ahmed Mismari told reporters his forces were in control of Tarhouna and Aziziya, two towns near Tripoli. He said five of his troops were killed. The development came as UN chief Guterres met Haftar in failed talks and left Libya with a "heavy heart." Guterres was deeply concerned after the meeting with Haftar who had ordered his self-proclaimed LNA and allied troops to march on Tripoli. "I still hope it is possible to avoid a bloody confrontation in and around Tripoli," Guterres tweeted. Haftar reportedly told the UN chief that his operation towards Tripoli will continue until "terrorism" has been defeated. The United Nations envoy for Libya said on Saturday the UN is working "day and night" to achieve peace and deter a military escalation in Libya. Ghassan Salame said that the UN is committed to reaching a political settlement, stressing that conflicting parties resorting to violence would not be accepted. The UN Security Council expressed concern on Friday about military activity near Libya's capital Tripoli, warning that it threatens the country's stability, and called on Haftar's LNA troops to halt all military movements. "They (the council) called on LNA forces to halt all military movements," said German UN Ambassador Christoph Heusgen, president of the council for April, reading a statement agreed by the body after it was briefed behind closed doors on the latest developments. Earlier on Friday, pro-Haftar forces were pushed back from a key checkpoint less than 30 km from Tripoli, checking their lightning advance on the capital, a security source said. Militiamen from the coastal town of Zawiya, west of Tripoli, retook the base after a "short exchange of fire," the source said on condition of anonymity. Anadolu Agency reported forces loyal to Libya's Tripoli-based government also captured 20 pro-Haftar soldiers. The advance by Haftar's forces on Thursday, which came as the United Nations prepares to convene a conference later this month on holding delayed elections, prompted visiting UN chief Guterres to voice his "deep concern." 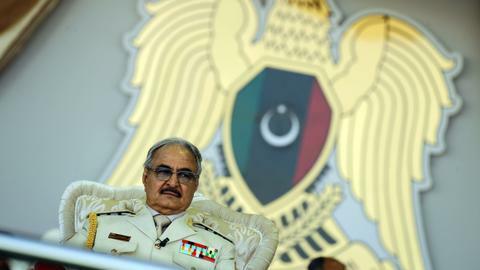 Haftar has remained a deeply controversial figure since he returned from exile after the revolution, with his critics accusing him of seeking to establish a new dictatorship with the support of his Gulf Arab allies.